CoSM Public Parking Structure #6 is a parking structure in downtown Santa Monica serving several major local and tourist destinations. At Second Street, the public realm is a dynamic overlap of retail, pedestrians, bikers, motorists, landscaping, and opportunities to sit and rest. This structure will be unique, however, in that the public ream does not stop at the ground floor, but continues up along the entire building face. The dynamic circulation zone at the façade invites all parking patrons to make their way to Second Street. This reduces way-finding confusion which plagues most parking garages. Patrons cascade up and down an exterior diagonal stair which weaves in and out of the plane of the facade. The façade is pulled away at the diagonal stair, bringing the movement of people to the fore. This serves a twofold purpose: first, to ensure safety in visibility, and second, offering unique ocean views. The façade functions as a light enhancement screen which is carefully crafted to bring light deep into the building structure, while eliminating harsh glare at the edge. This screen is composed of metal panels which are folded outwards to catch and redirect high angle sunlight into the depths of the structure. The portion which remains unfolded is perforated to allow for the passage of low angle light directly into the garage, and to provide a high degree of visual transparency. This combination allows for a greater amount of light to enter the garage over a longer period. From the street, the highly transparent façade appears busy with the passage of people, and the constant ever-changing backdrop of cars. 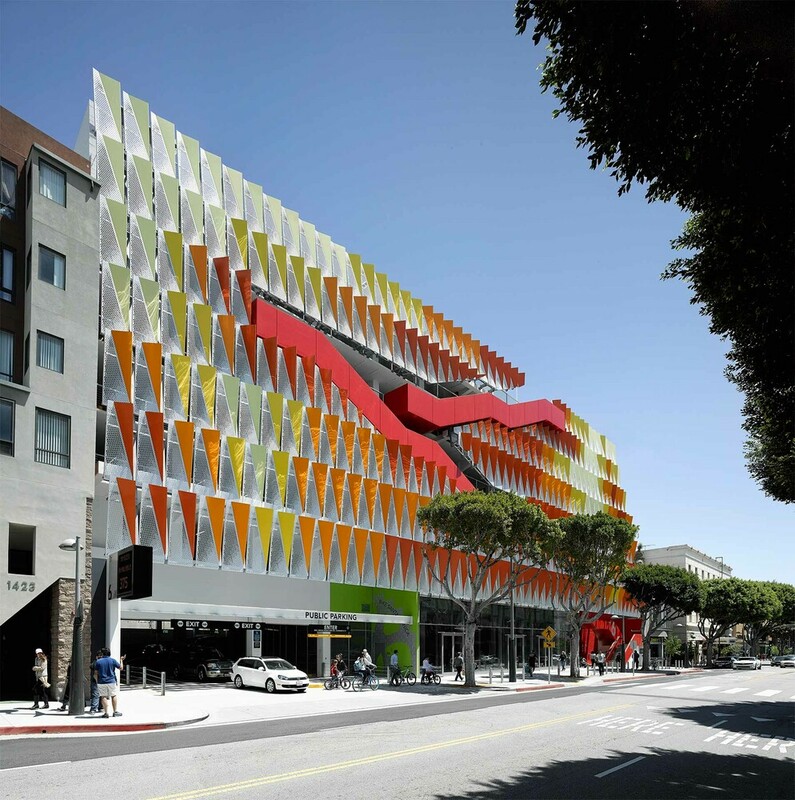 The façade not only provides a functional lighting aspect for the parking structure, it also creates a strong identity, enlivening the streetscape. 26.595 qm / 286,265 sq. ft.